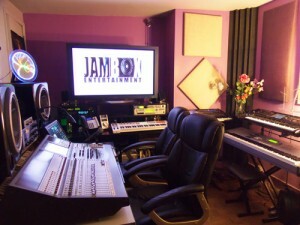 “Studio A” NYC is the premier recording studio at JAMBOX. This room has your classic ‘workhorse’ qualities. 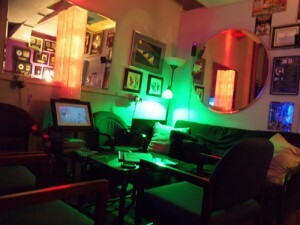 It has the top needed gear for mostly any type of project, access to our comfy lounge with all the amenities, and more. 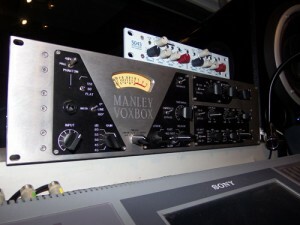 Studio A has developed into one of the best sounding studio facilities in the NYC area. We cater to some of the top acts in Hip Hop, R&B, Pop, Rap, Gospel, Rock, Acoustic, and Club/Dance music styles. Outfitted with some of the best analog and digital gear on the market, JAMBOX Entertainment’s “Studio A” in NYC is perfect for music recording, voice-overs, audio-book recording, video editing, mixing, CD and Audio Mastering, celebrity interviews, and various types of Corporate Audio work. The Blue Room at JAMBOX NYC, is a nice vibed-out out recording room. It has become a popular favorite amongst hip-hop, r&b, and pop clientele.The BLUE ROOM at JAMBOX has also become one of the most popular rooms in midtown NYC, due to it’s versatile nature. Cozy, with a very cool vibe and a great sound quality. “C-LAB” is JAMBOX’s budget-friendly studio. This studio is our go-to solution for one-on-one pre-production work, low-cost demo recording and editing, as well as music & media transfers, and more. JAMBOX Corporate Audio Services aims to provide a sound solution to your business audio needs. We offer high-quality audio-video related work and provide a professional yet relaxed and comfortable working environment in our top notch NYC recording studios. Book Your Listening Session In Our Studio A. You spend hundreds, thousands, even tens of thousands of dollars to create your best music. Not to mention the never-ending hours of time that you’ve invested into your project. Now, it’s time to present it. To who? Record exec, radio jock, promoter, film director, possible investor, even family…the list goes on and on. Got Oldies? Stacks of old LP’s, 33s, 45s, 78s you still love to listen to; they hold special memories for you. Music that takes you back and allows you to reflect and reminisce over those special endearing times in your life. Ditch those milkcrates filled with your favorite classic LP’s and convert your music to digital format! Our new Thermal Disc Printing produces high quality CD and DVD prints that are photo realistic. The technology we use redefines the industry. Photo-realistic images are only achievable with this printing technology. They are even sharper than replicated prints. Inkjet prints will easily scratch, fade, run, smudge and are not water-proof. This will never happen with thermal prints. Ours CDs won’t: Scratch, Fade, Run or Smudge and are Water-proof. Let us build a great song for you from the bottom up, or re-create an idea that an artist/songwriter already has. Your professionally produced song will take on a life of it’s own…and before you know it, you’ve created a monster song! Our production team will guide you through the whole process to ensure an amazing turn-out. Have your aspiring superstar child coached, recorded, and mentored by our award winning artists and producers. We will coach and mentor a select group of young aspiring artists between the ages of 8 and 18 years old. How about you and a bunch of friends singing together inside of a top NYC midtown professional recording studio, and recording a special song just like the pros do? At the end of the session, you’ll leave with your very own professionally mixed personalized CD. Even better… you’ll walk out having just lived one of your most memorable experiences. You can choose any cover song you’d like and put your own spin on it. Be wildly insane or mellow and tame. We got you! 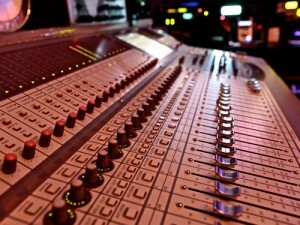 Our top industry producers will make you sound great! Best thing about it…it’s sooo much fun! Here is an opportunity for young students to do something fun different and very memorable JAMBOX Entertainment offers a unique tour service to schools and educational groups Bring your select students to our facility and let them see how the music business operates from the inside. Moreover each student will get to record their own voice and leave with a lasting momento. ​For over twenty years, JAMBOX has been providing its clients with top rate recording and audio services in midtown Manhattan New York City. JAMBOX Voice lessons is its newest service. Instructors Cáthia and Zephrah Soto will help you develop your voice and help reach your full potential as a singer! We design each class to fit your specific needs. Our lessons have been designed to strengthen any areas that need improvement. For over twenty years, JAMBOX Entertainment Recording Studios NYC has been providing its clients with top rate sound recording and audio services. JAMBOX Entertainment NYC Recording Studio’s current headquarters is on Seventh Ave. in midtown Manhattan NYC. For more than two decades (and counting!) we have been working with the best in the business creating quality music, and providing unique sound and audio services. The word about JAMBOX’s quality and abilities soon got around and started attracting many recording artists, indie labels, and even a couple of majors. In 1989, JAMBOX Recording Studios NYC relocated to the East Village and started to grow even more due to the new convenient location. Years later in 1998, JAMBOX outgrew it’s location and relocated to midtown Manhattan, expanding into a three room recording facility and broadening its services, officially becoming JAMBOX Entertainment Studios. Today, JAMBOX’s client list is in the thousands. We’ve worked with many labels, companies and artists, and have over 30 years of experience under our belt. JAMBOX Entertainment Studios NYC is a music company located in midtown Manhattan, New York City that functions primarily as a sound recording studio and music production and service company. Located in a three room recording facility on 352 Seventh Avenue, JAMBOX Entertainment Recording Studios NYC is co-owned by Lee Evans and Cathy Palmisano. It is known locally for recording and producing many notable New York and New Jersey based artists, such as the Naked Cowboy and Lori Michaels. JAMBOX Entertainment is a music entertainment company offering a variety of unique music, sound, and audio services. Our customers range from amateurs to music professionals, hobbyists to music lovers, with musical tastes ranging from mainstream to the eclectic. Included under our umbrella is our 501c3 non-profit organization ‘Reach Out Inc’ www.reachoutinc.com Reach Out Inc. is dedicated to helping children to make wise choices in life and educating against drugs, violence bullying, and promoting the awareness of Aids. Lee Evans is a Gold Album/award winning Producer/Songwriter/Engineer/Musician and a long time veteran of the music industry, with over 30 years background in the music industry. Starting as a child, thru the ages of 14-17 years old, Lee Evans wrote, arranged, played piano and sang for young harmony group “The Fourth Edition” a group that went on to win amateur night at the Apollo a whopping 6 times. Lee attributes his fine ear for harmonies to these times. The group shared the stage with the likes of Michael Jackson, James Brown, and other legends. After attending such notable schools as “The High School Of Music & Art (NYC)” Lee Evans set out on his musical life journey. As a keyboardist, Lee became a band member and musical director. In his early years he performed with many local bands and frequently led top recordings with acts such as “The Jimmy Castor Bunch” “Brass Construction” The Force MDs, “New Edition” “Afrikaa Bambaataa”, “Willie Colon” “Johnny Gill” “Kleer” “Bionic Boogie” “Joe Simon” “The Coasters”. 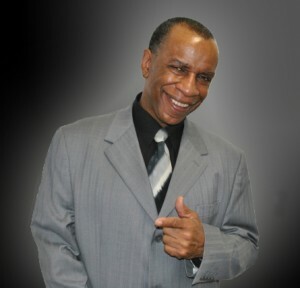 Lee Evans’ many accomplishments include his work with popular artists in the early stages of his career, “Cindi Lauper”, “Marc Anthony”, “Afrikaa Bambaataa”, “Harry Belafonte”, “The Force MDs”, “Brass Construction”, and a long list of dance Hip Hop and “latin freestyle” favorites from the ‘80’s and early 90’s. During this time, Mr. Evans became a familiar face in the most prominent NYC studios and earned a reputation as one of NYC’s top multi-keyboardist / producer /songwriter / engineers. Lee Evans started JAMBOX Entertainment in the Bronx in the ’80s but incorporated it in 1992 with co-owner Cathy Palmisano. In 1989, He co-founded 501C3 non profit org. 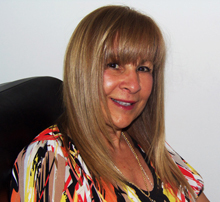 “Reach Out Inc” along with President Lori Michaels, and Executive Director Cathy Palmisano. Mr Evans became Musical Director. Reach Out Inc.s name is derived from a song called “Reach Out” which he wrote and produced. Lee Evans has created many innovative music programs such as: The Gift Of Song, AET Interactive Program, JAMBOX Artist Bootcamp, JAMBOX Elite Music Productions. Currently Mr. Evans is the CEO and co-owner of JAMBOX Entertainment Studios, Director of the AET Interactive Program, chief mastering engineer for CD Mastering NYC.com, production and music director for Reach Out Inc., and the director for the JAMBOX Artist Bootcamp. See Our Full List Of Over 1,200 Clients!